LAST NOVEMBER, I wrote about a Sunday drive. If you wish, you can revisit it here. During most of last month, due to the gasoline crisis that left most gas stations empty, we didn’t drive anywhere for fun, just necessity. But we’re back to normal with the gas stations, so we took a ride around our huge lake yesterday. 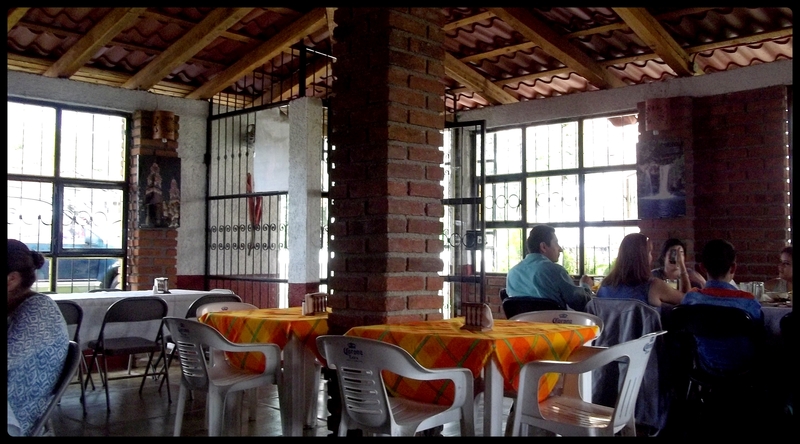 The principal objective was to eat lunch in a restaurant named Campestre Alemán. We just call it the German restaurant. I shot photos and videos so you could feel like you were with us. I filmed this video from our table which overlooked the restaurant’s man-made lake, complete with geese. Here are our plates of goulash. Campestre Alemán serves a mean goulash. I intended to order white German sausage, but it wasn’t available. This is a photo of another of the restaurant customers. I took this shot because I liked the look of the woman. She did not notice me. Some things are better in black and white. Having downed the goulash, we hopped back in the Honda and continued the circular route around the lake. Minutes later, we passed the restaurant where my child bride and I had our first date 18 years ago. She was so nervous she wanted to bring a niece along for the ride. Luckily, the niece begged off, so we were on our own, as we have remained for almost 17 years. We sat out on the porch you see up there in 2001. It was great. Continuing along, we passed this odd house, so I braked to take a photo. Some folks exhibit lots of imagination with little money. Mexican gnomes might live here. I later spotted this clothesline and the lake beyond. The only view of the lake I have to offer today, but we saw it quite a bit. It was at the end of our jaunt that I shot the video at the very top. We were almost home. The Hacienda is only about mile farther. Sometimes it’s good to get out of the house. WE RETURNED from Mexico City yesterday after spending five nights in that tumultuous burg, and I’ve never been so happy to get back to the Hacienda. We own a condo there, where my child bride lived when we met over 16 years ago, and we visit a couple of times a year to air it out. Otherwise, it just sits there, furnished and idle. We’d rent it if we could find someone reliable. Our condo is one of many in one of these buildings. Two of the four full days were dedicated to straightening out a financial matter, a pension fund, left over from when my wife worked as a civil engineer with the federal highway department. For some reason, offices at UNAM, the massive National Autonomous University of Mexico, are involved in the matter. I had never been to UNAM, which is in the southern side of Mexico City. Alas, our condo stands in the northern side. Since Mexico City traffic is beyond dreadful, this meant hours of sitting in taxis inching through traffic. Otherwise, the visit entailed cleaning the condo, and eating caldo de gallina one day in a nearby restaurant we found recently and barbecue hamburgers in a food truck just across the street from our place. So you get a feel for things, at top is a brief video I shot during the bus ride to the national capital, and below is another I shot from a Mexico City taxi. We were on our way to UNAM. Or maybe we were returning from UNAM. It really makes no difference whatsoever. Now I’ve got yard work to do. Things pile up when you’re gone. LAST WEEKEND, we leaped into the Honda and drove to the far side of our big lake to eat at a favorite restaurant in celebration of my child bride’s birthday. She’s 57. That may not sound like child-bride territory, but considering my advanced vintage, she could be my daughter. My actual daughter is only five years younger. She ordered beef. I ordered shrimp. It was very well-prepared. She said her beef was a bit overdone. She should have ordered shrimp, but separating a Mexican from beef is no simple matter. It’s like separating them from cheese and chiles. Especially when there’s celebration in the air. This was my plate of fried shrimp. I really like fried shrimp. One of the best things about this restaurant is the location. It sits alone near the shore of the lake. The views are spectacular. Below is a shot in another direction. Even if the shrimp weren’t great, the view would justify a visit. SUNDAY WAS Father’s Day, of course. Unlike Mother’s Day, which falls on different days in Mexico and the United States, Father’s Day is on the same day. One wonders why. I am a father, but my daughter has gone entirely, it seems, to her mother’s side (my first of three wives), and her mother long ago remarried, providing my daughter with a substitute, and he is a very good guy. That leaves me, apparently, not a father anymore. I have been deleted. That means, for me at least, yesterday was not Papa Day. It was Papacito Day, which is another matter altogether. Being a Mexican woman’s Papacito is a romantic thing. And being a Mexican man’s Mamacita is too. I am married to my Mamacita, and she is married to her Papacito. It is not always that way. You can have a Mamacita or Papacito on the side. Even though you can get into trouble doing that, it is fairly common. We celebrated Papacito Day by dining in a nice restaurant just outside a village near here. The restaurant has an unpronounceable name that comes from our local indigenous people. I think it’s sort of silly to put an unpronounceable name to a business, but it seems to be doing well. And here is the restaurant. It’s a humble place. The ceiling and the roof are one and the same. Beams and artificial clay tiles. A major storm erupted while we were both digging into plates of breaded fish and guacamole, and a few raindrops fell on my gray-haired head. So you may be asking, What’s with the airliner? I snapped that shot on Sunday too, as we were driving to the restaurant. Our hardscrabble neighborhood on the upside of town is where you’ll find our airport. It’s a dirt strip, and walking distance from the Hacienda. A few years back, someone started an ultralight business there for tourists to see the area from on high. In the early days, we often had two-seater ultralights over the Hacienda. But that’s kind of petered out. And we’ve had hot-air balloon festivals at that airport too. But not recently. It was trucked here. The wings were removed and the tail too, leaving just the cylindrical body, which was lowered onto some monster trailer and pulled by a semi. It came from the direction of the state capital, and everything was going fine until it arrived at the turn here in our neighborhood. A DC-9 corners poorly. At the right turn from the main highway onto the secondary road, there is a gentle incline downward, and there is a carnitas stand right on that corner, directly by the highway, and it was the eating hour. As the airliner entered the turn, it began to roll off its trailer. It landed on the highway with a considerable thump, one imagines, I was not there, wish I had been, and began to roll toward the carnitas stand. You can imagine the eyeballs of the fellow slicing carnitas as the DC-9 rolled toward him. It stopped just a few feet away. 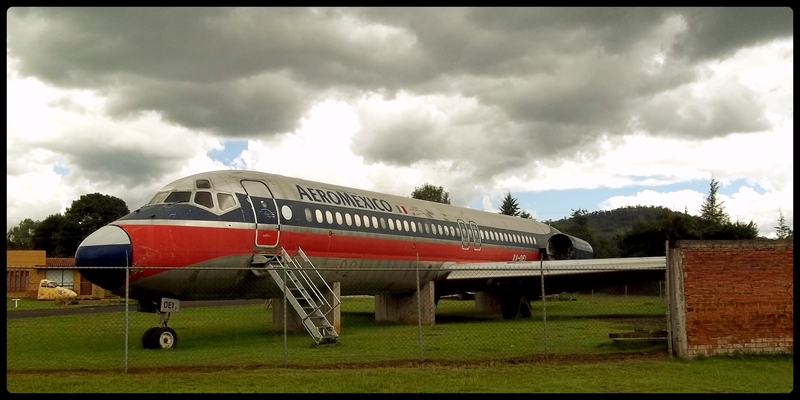 I happened to drive by minutes later and saw the airliner resting on the highway, which is not something you see very often, especially without blood, body parts, mangled luggage and flame-retarding foam. To make a long story shorter, they got it off the highway somehow, and later installed it on a concrete stand at the nearby airport, and put the wings back on, plus the jet housings. Months later, I drove to the airport, and the owner was there, the same guy with the ultralight business, and he gave me a tour inside the jet. The seats were missing, but it’s fun to stand inside a bit of aviation history. I took this shot Sunday, and we continued on to the restaurant with the unpronounceable name, breaded fish and terrific rainstorm. All told, it was a good Papacito Day. And I hope I have lots more.